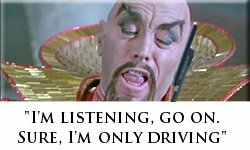 The Borg; Ming the Merciless Informer; and a Delightful Absence of Politicians - Charley Brady - Opinons; My Own. Well, it’s been a relatively quiet week in Lake Wobegon, Ireland. There have been relatively few scandals; relatively few new ways thought up in order to gouge more money from our empty pockets; and relatively few things to set the teeth on edge and the blood pounding. Or maybe we’re just becoming immune to it all. Don’t forget though, I did say ‘relatively’. There have of course been illuminating little insights into the collective Borg mind that is the political… ‘brain’, for want of a better word. One would of course be the cautionary tale of Deputy Luke ‘Ming the Merciless’ Flanagan who thought to take the moral high ground concerning the wiping out of penalty motoring points for certain important individuals, but who ended up showing us that he is just another conniving, two-faced hypocrite. Talk about stunts backfiring on a person. I’ll tell you something: if it had been Ming’s namesake and Flash Gordon’s arch enemy conjuring up this ‘cunning plan’ there would have been a far better one in place. Maybe too much of the wacky baccy that Flanagan openly says that he smokes has messed up his brain cells but I doubt it. I think that the humdrum reality is just that he’s a bit of an eejit. No way would the odd joint have you dreaming up Ming’s plots. You would need some good industrial strength acid for his scenarios. He had kept us on tenterhooks (yawn) on the run-up to last Tuesday when he had intimated through endless tweets that we had better have the old ear trumpets switched to maximum power because he would be coming out with revelations that would shake Irish society to its very foundations! Or something like that. It all kind of reminded me of those newspaper ads that ran a few years ago. You would turn the page and there would be the cryptic question: “Who is Keyser Soze?” That’s all, nothing else. You’d be scratching your head and saying “What the…?” And then at the end of the week was released the classic movie “The Usual Suspects”. It was very clever really, and I wonder if Ming was thinking of that when he released tweet after (good lord, I’m yawning again) tantalising tweet as to WHAT WOULD HAPPEN ON TUESDAY. Well, it was interesting all right; it just wasn’t interesting in the way that Ming meant it to be. This was more like a weird insight into the mindset of the common or garden-variety inhabitant of the Dail Chambers. Here was a guy who had repeatedly whined about what he perceived to be corruption amongst our Gardai. (Indeed, he did this most memorably and most despicably on the eve of the burial of Detective Garda Adrian Donohoe, shot dead in the line of duty.) In particular he was constantly aghast at the thought that certain people were having their penalty points wiped out. And so it came to pass that Luke ‘Ming’ Flanagan, Roscommon-Leitrim TD, confessed to us that he was one of them. According to Ming an obliging sergeant told him that he could qualify under Dail privilege to have his wrong-doing erased from history—and the records. (He had been talking on the phone whilst driving.) So off went the bould Ming to get quill and inkpot ready, off dashed a letter to the Gardai and before you could say ‘Winged Men of Mongo’ all was right in the mad, mad world of Luke Flanagan. Here it began (began?) to get confusing, though. It seems that he had had his points written off on TWO occasions and that he was willing to—wait for it– name the men who had helped him! One of these men is supposedly Frank Dawson, Roscommon county manager and the policeman has yet to be identified since Flanagan was stopped in his attempt to name him by the Dail. It must be said also that Mr. Dawson has sworn to fight the allegation and I certainly hope that he does. A man allegedly offers to help you wipe some motor violation points off and you accept it, thank him and then drag him into the sewage tank with you? We’re well used at this stage to our politicians being liars and hypocrites; but now to this we can add that word that is so loaded with historical context in Ireland. We can add ‘informer.’ And this isn’t informing on some thug who belongs in jail or on some corporate body that is trampling over somebody; no, this is informing on someone who has done you a good turn—rightly or wrongly–; you have agreed to him doing this; and then you have proceeded to grass him up. Sensing that he was making a right pig’s ear of things Flanagan then claimed that he had allowed his points to be wiped as part of a strategy—his word, ‘strategy’—that he had set up in order to catch out Justice Minister Alan Shatter. Well, Ming, this plan of yours was so well thought out…what could possibly go wrong? Seriously, what on earth was he thinking? It’s not as if he is a complete idiot, or at least he didn’t used to be, because I have heard him talk sense in the past. Is it just as I’ve always asked: even if on the off chance that they have ideals when they enter the Dail, does the system by its very nature turn them to the Dark Side? Are you getting a load of that? McGrath is ‘disillusioned’! He’s fierce upset altogether, so he is, what with worrying about integrity and reputation and high-sounding words like that. He had no idea there was skulduggery and shenanigans of all sorts going on in the Dail, which has always been a byword for truth and decency in his befuddled head. It’ll come as a terrible shock altogether to the poor devil when he finds out that he’s still holding hands with that good pal of Ming and admitted tax dodger TD Mick Wallace. Ach, the sheer hypocrisy of them would make you want to eat your own vomit. He doesn’t think it’s a resigning matter. He doesn’t ‘think’ it is. Across the water in Britain, a place where politicians found guilty of wrong-doing actually resign, are booted out, or go to jail, there is a guy called Chris Huhne who Ming should really read up on. He is banged up for eight months—another case that came down to penalty points. I’ve wasted enough time on Ming and I’ve enough to be doing with corrupt Irish politicians but if you’re interested in the different way that British chancers and Irish chancers are treated the Huhne case is quite instructive. Anyway, that was just one little scandal in a relatively quiet week. Now the reason that I keep saying ‘relatively’ is because we have relatively few politicians hanging around to upset us. You know why, of course. Yes! This is St. Patricks’ Weekend—or week—or month or whatever the hell it is this year. Either I’m getting grumpier or the damned thing goes on for longer every time. At least it keeps them out of our hair for a week or two. You’ll have quite a few of them over in America, on their freebies and fact finding missions so please try to remember what I mentioned some weeks back in relation to The Gathering. If you come across any stray Irish politicos they’ll more than likely try to shake your hand, all the while putting on that insincere flaky-looking grin that is common to politicians of all nationalities. If you absolutely, positively MUST press the flesh with them, then check immediately afterwards to make sure that they haven’t stolen your watch or in some extreme cases– like for example Michael Lowry– perhaps a couple of your fingers. But really it’s best if you ignore them altogether. I see that Obama tried that with Enda Kenny. At least he got out of meeting him and his goons on Paddy’s Day itself and managed to put back the handing over of the bowl of shamrock until Tuesday. Poor sod. I hope he doesn’t make the mistake of complimenting Dame Edna on his Time magazine cover or he’ll be listening to him drone on until Christmas. I really didn’t take much heed of where they had freeloaded off to at our expense this year because it’s just nicer here without them. I couldn’t help being a little taken aback by one particular junket however, especially in light of who seems to be paying for it. Ten of our beloved TDs and Senators are travelling around your fair land on a “fact finding mission” regarding…abortion? All the way to the States to ask about this? Now this is decidedly odd. Because Fine Gael and Labour have made it clear that after two decades of hoping that the issue would just go away they are now tackling it. No matter how reluctantly and half-assed. Health Minister James Reilly is at the moment preparing to legislate in cases where there is a medical threat to the life of the mother or even if a potential suicide is involved. So Enda and Company aren’t too happy at some rogue politicians and Senators going a-fact finding whilst being members of the Party. What makes this highly dodgy for me is that they come as guests of the extreme anti-abortion group Family & Life. (It is not clear whether the organisation is paying for everyone yet.) I’ve been following this organisation with great interest for a while now. If you’re interested you can go on their site and part with some of your hard-earned cash in order to bring holy icons over to Ireland. You know, that kind of medieval nonsense. They are critical of Enda Kenny and his party in a way that makes me look like the voice of moderation. But worse of all to my mind is how often they are linked with the appalling organisation Youth Defence. These are the dreadful people who produce such posters as the one with a woman’s face, a sniper target imposed over it and the words “Would you still be pro-choice if you were the one being chosen?” They’re also good with language if you like this kind of thing: “Don’t say Doctor or Physician—say Abortionist.” I’ll have to leave Youth Defence for the moment but hope to get back to them soon as I don’t like the idea of not being on their hate list yet. Some of the best people are. Anyway, they say that you can judge a person by his friends so that’s all I need to know about Family & Life. The organisation must have a bit of cash floating around because in New York the politicians were being put up at the Cornell Club and then it was off to Washington to ferret out more facts. The Fine Gael TDs include Peter Matthews and Terrence Flanagan whilst Mattie McGrath is there as an Independent. There are three Fianna Fail Senators also and a couple of Fine Gael Senators, Paul Bradford and Fidelma Healy Eames. The latter is disappointing to me as she lives near me and has never been less than pleasant and very helpful despite the hammering that she has taken from the press at times. She has confirmed that her trip is being payed for by Family & Life and described it ludicrously as “a search for truth”. Fidelma, if you want the truth on abortion you only have to travel to England, not 2,000 miles away; or else talk to some of the young women who have had to go there. Isn’t England where we have been passing our abortion problem onto for over half a century? America? Call this trip what it is: a junket that is being funded by some very extreme people for their own purposes and with whom you are now inextricably linked. Oh, poor Deputy Luke ‘Ming the Merciless’ Flanagan, and his plan to root out garda, what is the word, overlooking? Of TD’s what? Over zelous driving? Sure. Years ago I was driving back from a pension conference in Springfield, Illinois and got behind a car with state senate plates on the highway and decided to keep up with it. We did 100+ in a 55 MPH for miles and miles and no one stopped us. Fastest time between Springfield and Chicago I have ever done. Now let’s think, where do Garda pay raises come from? In fact where is any Garda money coming from? So, are we, the Garda, going to really make the TDs unhappy? Think again. Good old Ming just got caught out so he has to come up with a story, and sure, the folks back home will believe it.